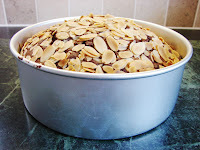 I found this nutella cake recipe from Good food mag . Was inspired by it but like to use more Nutella than just 4 tbsp in a large cake and don't like the cinnamon in chocolate cake . So I made up my own mix with less butter, sugar and a lot more nutella. The mixture filled about 1/2 the tin, it grew and grew in the oven to more like a little mountain. I was really pleased with it, had just tried a piece after I have taken the photo. It was nice and light. Will definitely made it again, maybe I will try peanut butter next time. 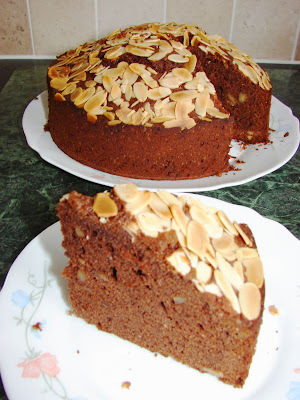 I reckon the cake will be even nicer and moister if sliced in half and filled with cream or ground hazelnut chocolate garnache. Beat the butter and sugar till light, then add nutella continue beating till very light. Add the eggs in one at the time till all combined and very light. Add in the flour mixture a bit at a time and some milk till till the mixture is smooth. Bake at 170deg C fan oven or 180deg C non fan over for about 1 hour 10 minutes or till the cake is cooked through.